I participated in a very interesting conference today. 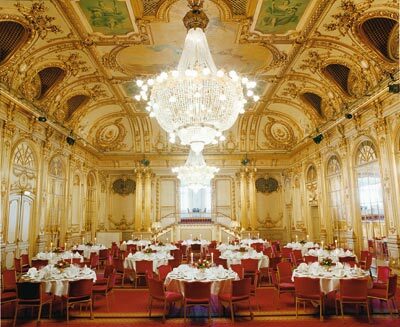 Arranged by the newspaper ‘Chef’, the conference gathered 200 managers from around Sweden at the Grand Hotel in Stockholm. The aim of the day was to listen to interesting and inspiring leaders and the day did in fact offer a variety of people and opinions. SKF’s CEO Tom Johnstone talked about the importance of accessibility. Marie Louise Ekman, head of the Royal Dramatic Theatre stressed the skill of creativity. And Jens Henriksson, Managing Director of Stockholm Stock Exchange emphasised loyalty. But perhaps the most provocative and ‘news-worthy’ guest was the leader of the major political oppposition party Håkan Juholt. Currently in hot water due to scandal around fraudulent housing benefits, everyone listened to Håkan with bated breath. What would he say about the scandals? Would he announce his resignation? The theme of the conference was ‘Happy and a Manager – yes, it’s possible’ and Håkan Juholt reinforced several times that, despite his current situation, he is happy. So no juicy gossip and no resígnation. Just the usual political rhetoric. As I sat and listened to the guests talking about what makes them happy as bosses, I was struck by the Swedishness of the entire theme. Would you find the same theme at a conference in Nigeria or in Russia? Probably not. In many other countries, the focus of leadership rests on efficiency or productivity or results. Of course, it does in Sweden too, but here we also have the luxury to reflect over our happiness also. We don’t have to worry so much about where the next meal is coming from or if our job is secure or our health insurance is enough. We’ve solved many of the issues of survival and can focus our energies on something else. Ourselves. And how we feel. But does the opportunity to reflect over our happiness actually make us any happier? Now that’s worth thinking about.